Engage your students with these colorful Google Slide activities in your Google Classroom as they learn the proper punctuation for book titles. 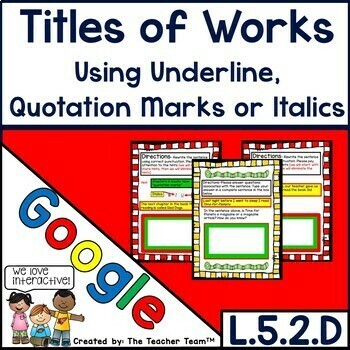 This resource covers underlining, quotation marks, or italics to indicate titles of works. PERFECT for ELA Centers, DAILY 5 Word Work Rotations, Literacy Stations, SUB PLANS, Test Prep, Homework, and for your whole class using Google Classroom. No-Prep, Paperless Word Work practice! 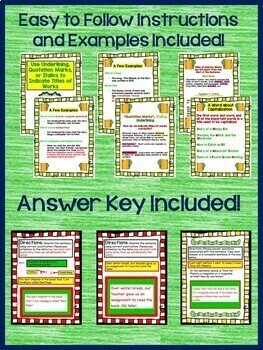 Use with any ELA reading curriculum, book, or story! 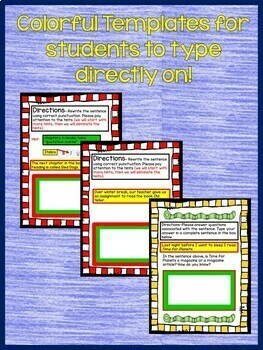 Students learn or enhance their typing and keyboarding skills by typing words and sentences while doing this fun activity! We have a variety of activities to reach all ability levels, from English Learners or at risk students to students who need challenge and enrichment. Our growing collection of English Language Arts Google based activities is a staple in our classrooms. You can use this product in its entirety, or “pick and choose” the slides you wish to use and tailor it to your students’ needs. If you like this product, please check back soon as we will be posting new products in the near future. If you have any questions or concerns, please do not hesitate to contact us and we will promptly help you. Thank you! DISCLAIMER: These materials were prepared by The Teacher Team and have neither been developed, reviewed, nor endorsed by Google. The Teacher Team and Google Interactive Digital! Products are not associated with other brand names, product names, or trademarks cited in this product, including the Google Drive™ online storage service. This product is an independent publication and is not affiliated with, nor has it been authorized, sponsored, or otherwise approved by Google Inc.